The presence of such animals is a huge problem in places where they are protected. For instance, in Canada, federal regulations ensure local geese (Branta Canadensis) are not trapped, harmed or killed. This wouldn’t be an issue if the birds were isolated. However, this isn’t the case for the animals, as they have a reputation for wreaking havoc on parks, golf courses, airports and residential yards. Furthermore, some animals, like beavers and raccoons, can only be hunted during specific seasons. During the rest of the year, individuals living near the creatures are forced to use non-invasive animal control methods. Flashing lights, lasers, alarms and ultrasonic waves are examples of animal control techniques that are not harmful to wildlife (when used properly). Flashing strobe lights and lasers are effective frightening devices for persistent pests and animals. Starting with strobe lights, the unit’s rapid flashing pattern can disorient birds that rely on visual markings for aerial navigation. When a bird encounters a flashing strobe, at a rate of 75+ flashes per minute, its immediate reaction is to avoid the beam. However, prolonged exposure to a green flashing strobe light can lead to habituation (more on this later) for smart, crafty animals. It is important to consider that the flashing strobe must utilize a color that can be detected by the target creature. The use of flashing strobe lights to deter the presence of wildlife pests is recommended by the UK’s Department of the Environment, Food and Rural Affairs (DEFRA). A major drawback with using strobe lights is their ineffectiveness during bright, daytime conditions. For daytime animal control, green or red lasers (depending on the target animal) are highly recommended. According to a 2003 white paper published by the University of Nebraska (Use of frightening devices in wildlife damage management, the main concern with using strobes and lasers to deter wildlife pests is habituation. The natural phenomenon occurs when a creature adjusts or evolves to the animal control method. This behavior is similar to human operators being prone to habituation after long-term exposure to loud forklift warning alarms in industrial facilities. To address such issues, a blue forklift laser light may be used to break the innate cycle. Going back to pest control techniques, using green flashing strobes or lasers to mitigate the presence of creatures is most effective when the target animal has not developed a feeding pattern at the location. For instance, when a bird distinguishes a certain plot of land as a reliable food source (due to the presence of seeds and insects), it will continuously go to the location when it is hungry. This pattern is difficult to break; and using animal control may even cause such creatures to become persistent or aggressive, based on their natural tendency to become territorial around food sources. The first time one notices the intrusion of unwanted animals on the property (signs include property damage, fresh tracks or markings), control methods should be deployed immediately. There are a handful of best practices to take into consideration to reduce or delay the onset of habituation. One low-cost method involves periodically moving the strobe light or laser, so that the beams target the creatures from different angles. Another option includes changing the color or flashing pattern of the fixture. Alternatively, individuals could also keep the animals guessing by changing the duration of illumination. It would also be possible to incorporate other types of non-invasive animal control methods, such as alarms, ultrasonic waves and reflectors. The Larson Electronics High Output LED Strobe Beacon (SLEDB-5-M) is a powerful strobe light that can be used for non-invasive animal control. This compact strobe is battery-powered and rechargeable via built-in solar panels or a common vehicle charger plug. Featuring an effective distance of 1,000 feet, the luminary is capable strobing at a rate of 1 flash per second. The weatherproof design and polycarbonate lens ensures durability in outdoor, remote environments. Mounting is facilitated by a magnetic pad located under the strobe. This mounting style does not require tools. 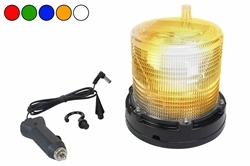 Alternatively, operators can permanently mount the LED flashing strobe on flat surfaces.